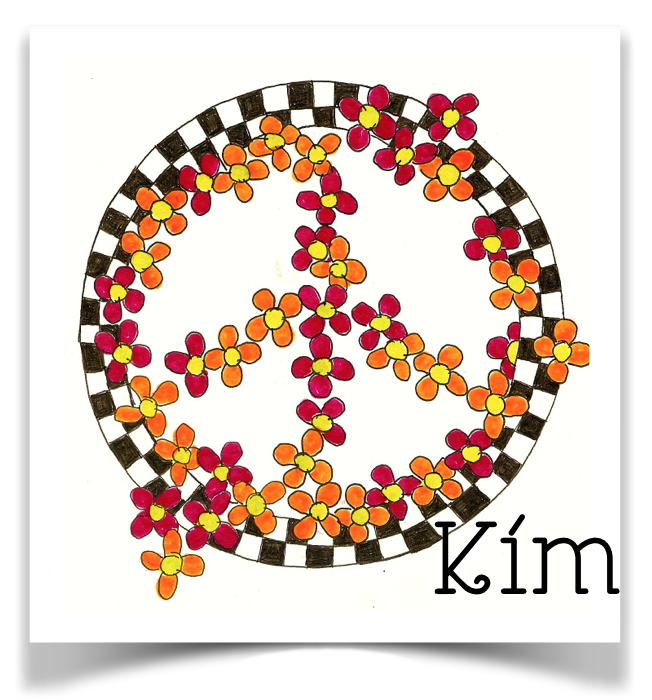 This is a cool, fun, fast way to transfer drawings or letters. It works great on the pages of your Bible because they are thin. You could also do it on vellum or tracing paper. 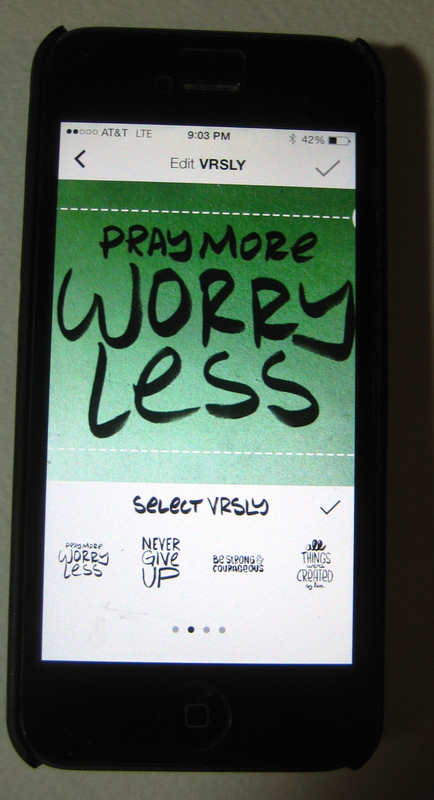 There’s this app called VRSLY. It cost 99 cents. 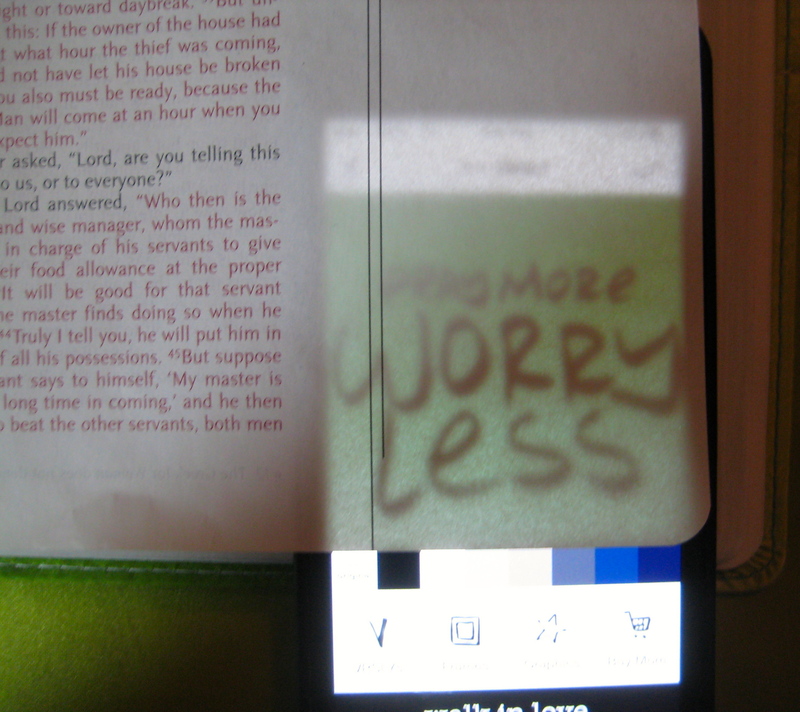 I loaded it to my iPhone because it is just the right size for the words to fit in the margin of my journaling Bible. I am thinking about loading it to my iPad for larger transfer projects, too. If you find other words or drawings you would like to use, just take a pic of them with your phone, and do the same technique. 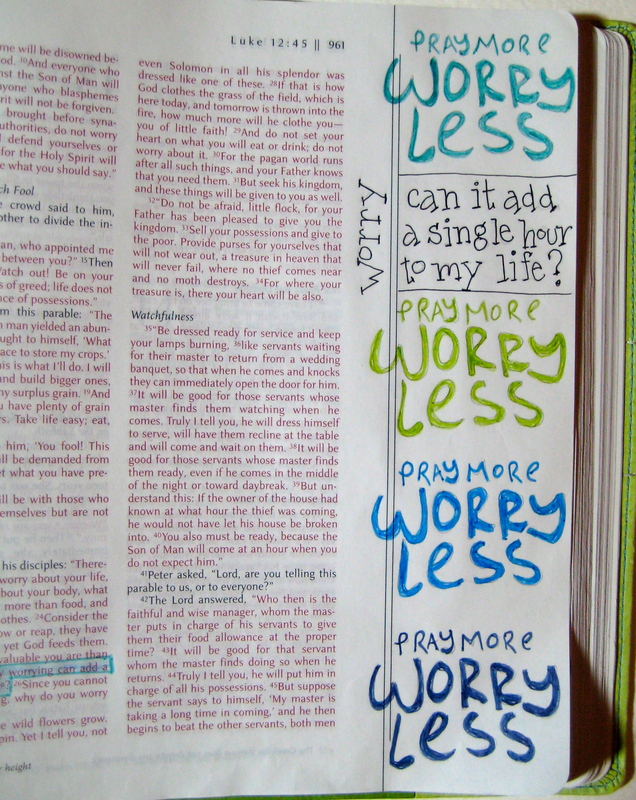 VRSLY gives you inspirational words/sayings that you will have no trouble fitting into your bible journalling. …trace them with a pencil. Fast and handy, right? I colored the words with Pitt pens. They are fine point pens. They don’t bleed through the thin pages. Use colored pencils or watercolors, or whatever you like. It started last Sunday with a sermon on perseverance. Timely. I had a week at work in which I could not catch up or even feel like I could get my feet under me. Perseverance was on my mind, and in my prayers. On the day I was thinking about finding a corner and hiding, I walked past Frank in the warehouse and he said, “I have a thought for you.” He looked right at me and said, “self-control.” Really? I had not spoken to Frank at all yet that week. But, I knew that self-control was in the verses I had been pondering. 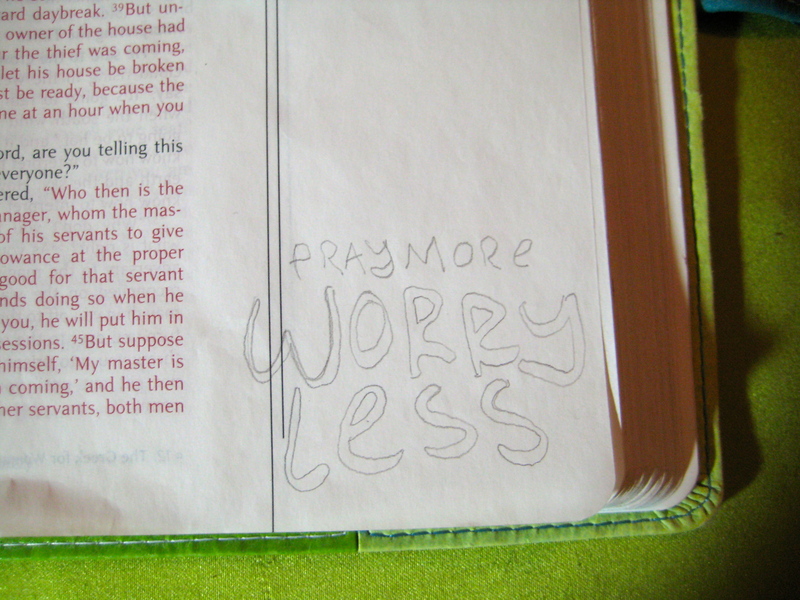 This afternoon, I was working through part of my weekly Bible study for class. God led me through His plan that when we believe, we clothe ourselves with Christ. See Galatians 3: 27. This week’s lesson was about shucking off all of the old horrible things, like bitterness, clamor, unwholesome words, and slander…to name a few. All of these popped up during crazy week at work. The thing about believing the gospel and clothing ourselves with Christ is that we have the tools to do away with those old things and be renewed to a true knowledge according to the image of God, our Creator. OK, yes, knowledge is also in the verses of the week. I see that God is backing me up through the verses, so if I continue to back up on my own, I reach moral excellence, and then faith. 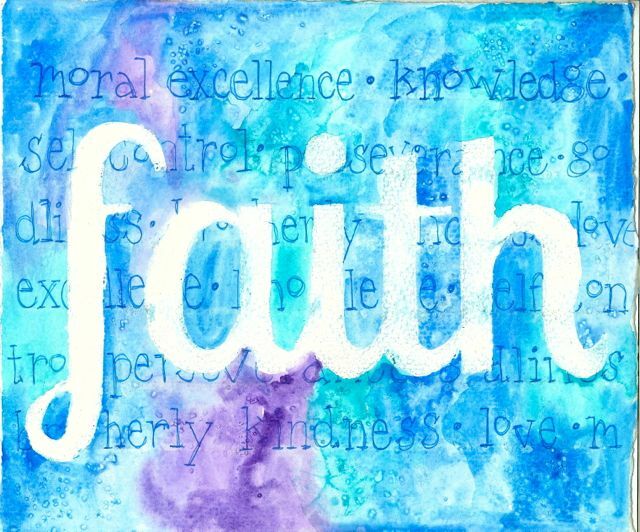 Faith, as always, is where it begins. God has put me where I am for whatever reason, and I just need to have faith that His plan is perfect. Moral excellence will make me feel better about myself if I can’t deal better about work just yet. Getting rid of the bitterness and the clamor will be a great start. I can do that because I have faith that He is working His plan. Knowledge is supplied by moral excellence. I have the knowledge that God is with me and leading me because I cannot achieve moral excellence on my own. No way. Self-control is easier when I apply the knowledge that God is in control of all of this. I just have to mind my thoughts and actions. He will take care of the work stuff. And perseverance seems easier when I don’t need to expend energy on whining and complaining. All He is asking me to do is keep going. Then I can work my way to godliness, brotherly kindness, and love. That will be great, and I am praying for continued help with all of this. 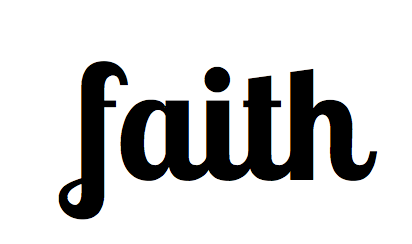 1. print the pattern for faith. You can change the size to fit your paper. 2. 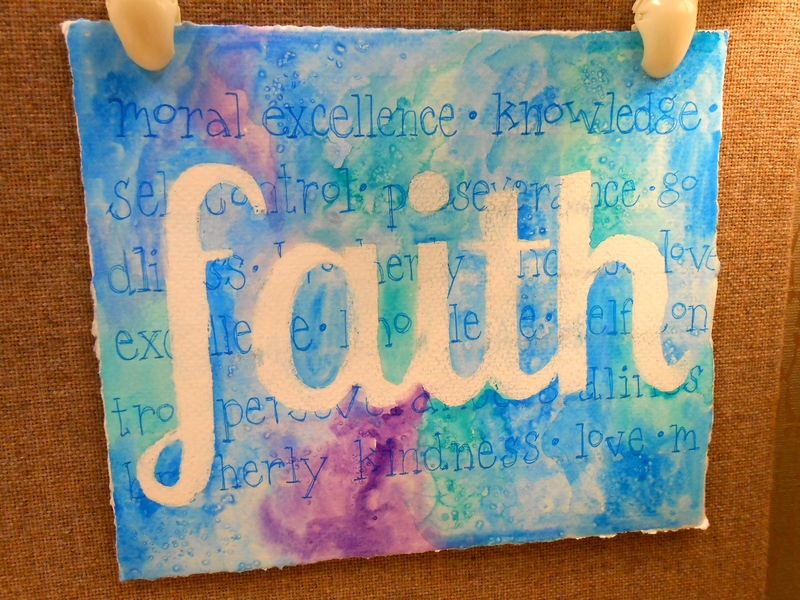 Transfer the word to the center of the watercolor paper. Here are some instructions to do that quickly. Use a light hand in doing this. You want only very faint pattern lines on your watercolor paper. 3. Color in the word with the white crayon. It doesn’t matter if it is perfect, but heavier is better than lighter. I can’t show you this because white on white = you can’t see anything. 4. Using your water brush and watercolors, and working quickly, apply paint to cover the entire background. 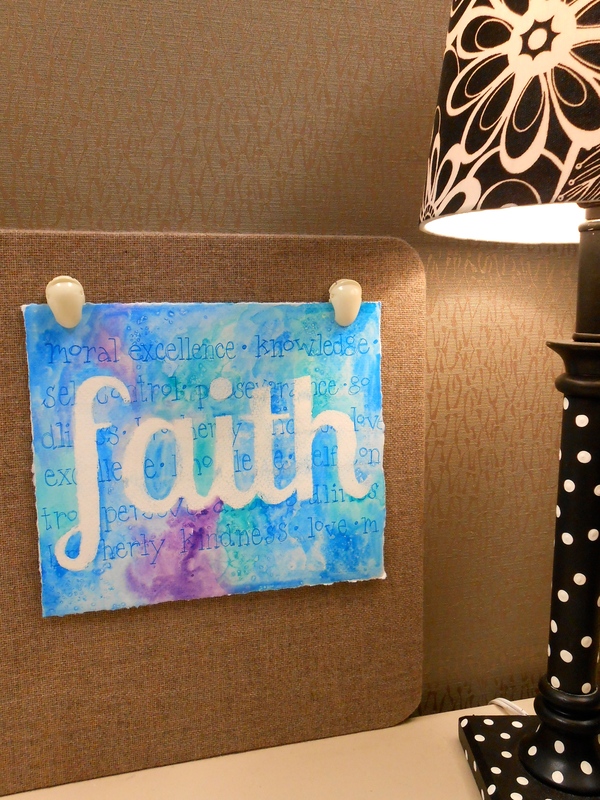 The crayon will keep the paint from coloring up your faith. (There is a spiritual lesson in there someplace.) If you use more than one color, working quickly will help the colors blend into each other better. Sprinkle a little sea salt on the wet watercolors here and there to add some texture to the background. Let the paint dry completely. Brush the salt off the paper. See what the salt does? 5. 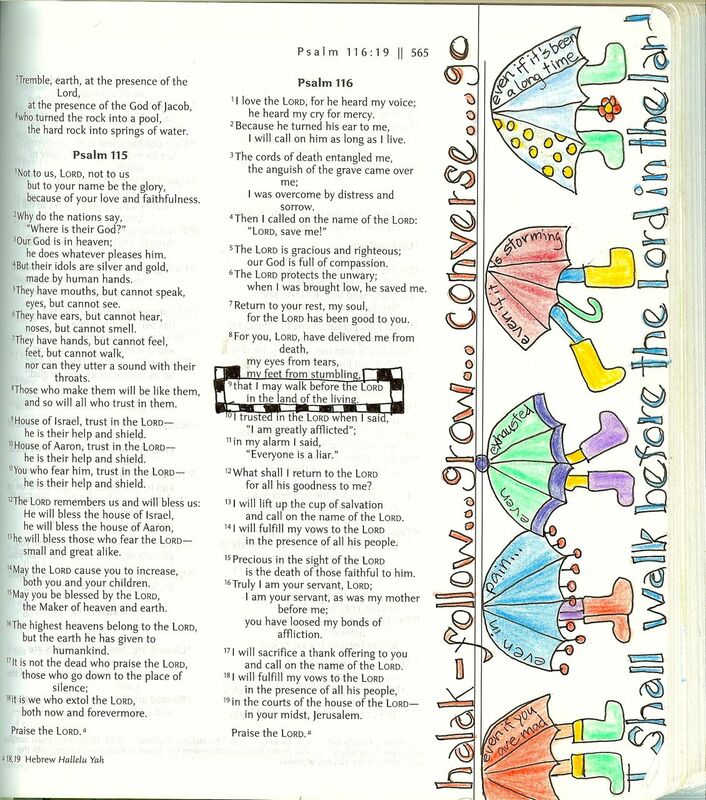 Use the fine point marker to write whatever parts of the verses you want to remember. 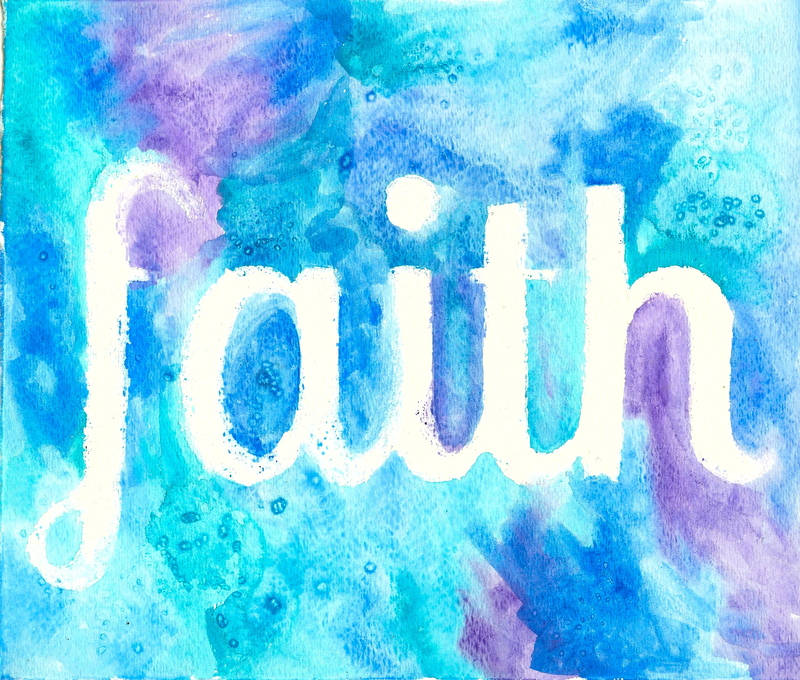 I did not write across the crayon, so it looks like the words are under the big word faith. Before I did that, I used a ruler and a pencil to make very very faint horizontal lines across the paper, so my words went straight across. I used really light pressure on the eraser to remove them after I finished writing. I pinned mine to the bulletin board, but you can punch holes at the top and add a ribbon or wire to hang it. And I am praying for moral excellence this week.